My goal is to engage the observer in this moment. My sculptures are muscular movements with intimate, provocative, mysterious, sensuous and even humorous moments. A single piece represents an amalgam of relationships. The sculptures speak through association and metaphor, awakening and stimulating imagination, mine and I hope yours. I begin my creative process with pencil drawings. They narrate my interior dialogue. I work the ideas until a leading image emerges. I commit and begin to cut, glue, and join wood beams to one another. I often return to my sketch book to solve issues that arise, in this way I navigate through each piece. I build and I grind and I sand to further articulate form, texture and detail. Surface and color are high-ranking. 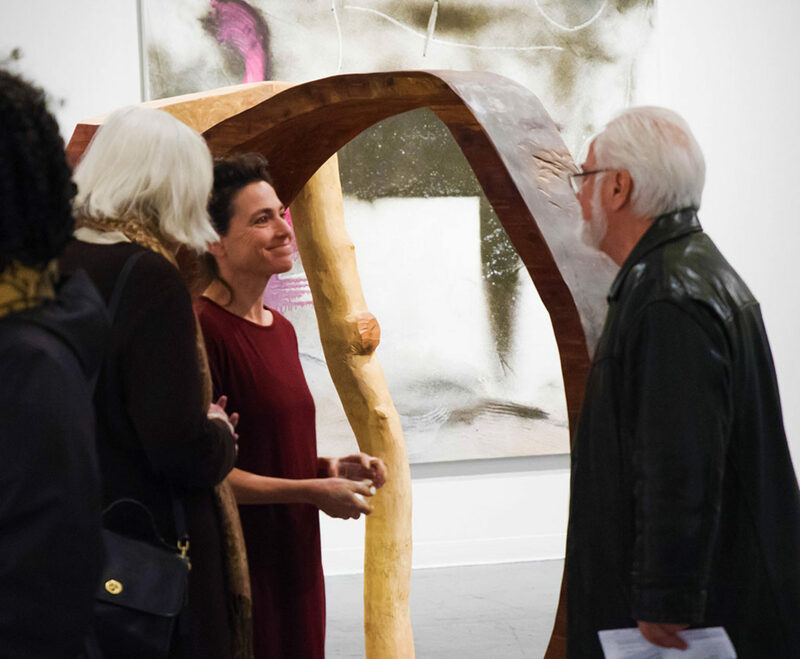 Rachel Rotenberg creates an aesthetic world of wood sculpture populated by sensually curving surfaces, intriguingly formed negative spaces, and forceful volumes. The artist begins her process by drawing in a sketchbook. Using sticks of cedar lumber she builds her sculptures. Evocative stains and colors are applied to the finished pieces. Rotenberg was born in Toronto, Canada. She attended University in Toronto, Jerusalem and New York City receiving her BFA from York University in 1981. In 1984 she moved to a studio in Williamsburg Brooklyn choosing wood as her primary medium. Rotenberg moved to Baltimore with her family in 1994. 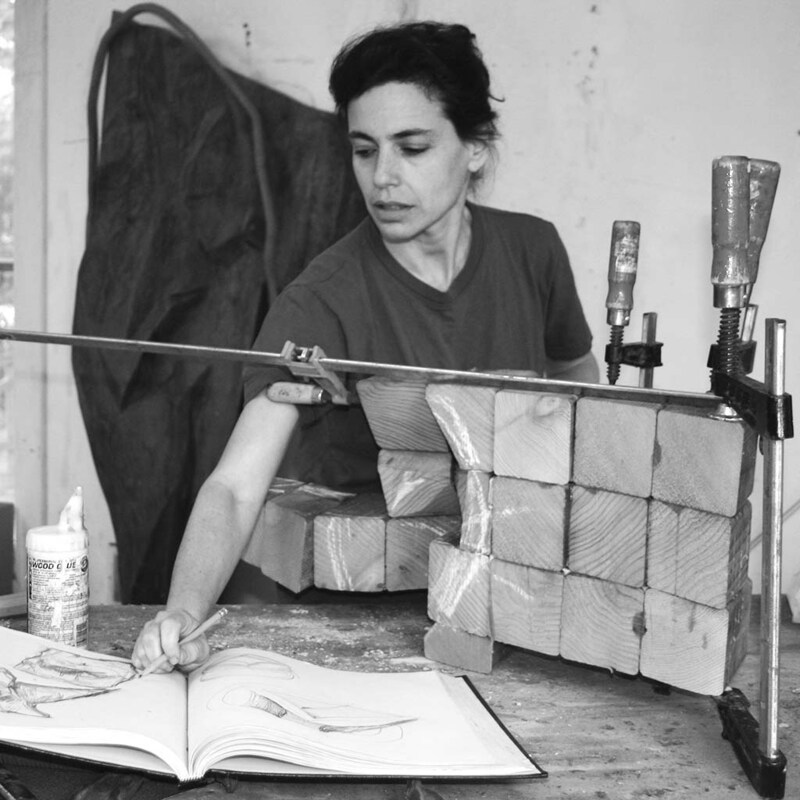 In 2014 she began sculpting for extended periods of time overseas in Israel . Rachel Rotenberg has received artist grants from the Franz and Virginia Bader Fund, the Harold and Ruth Chenven Foundation and the Pollock-Krasner Foundation. She has also received a Creative Baltimore Individual Artist Award, and grants from the Art Bank of Canada and the E.D. Foundation. Rotenberg has exhibited her sculpture throughout the north east corridor of the United States including solo exhibits in The McLean Project for the Arts, Baltimore Museum of Art, Maryland Hall for the Creative Arts, Mount St. Mary’s University, Saint Joseph’s University in Philadelphia, Hillyer Art Gallery in Washington DC, The Washington County Museum of Art and many area galleries including the Montpelier Arts Center, Fredrick’s Deplaine Visual Arts Center, Atkins Arboretum Gallery, and Baltimore’s Creative Alliance at the Patterson.